Beth email me at bebop480@gmail.com with your address and I will mail your onesie out to you! If you are curious as to how I came up with the winner here is my procedure. 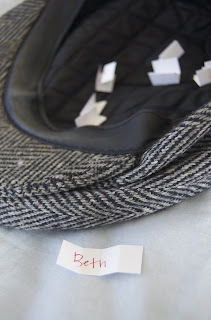 I wrote everyone's name down who entered on a slip of paper, folded them twice, put them in a hat, and picked one. I couldn't figure out a more random way to choose. Tomorrow will be a tutorial on hair clips! Check back for more cuteness. Wahoo!!!!!!! I never win anything. Seriously. That is awesome. I will post a pic of Audrey in her cute little onesie for you on my blog. Darn! Oh well, we can just make some together the next time you come out this way! Oh, I made your Munchkin some baby shoes but they look way to big. Email me the size of her feet (lenght and width) so I can see if they'll fit! Big sigh, oh well, I never win anyway. :) I look forward to seeing all the fun adorable new things you come up with. Even if it is a girlie thing, I have lots of friends with girls!